Essie Polish "Love Every Minute"
In the summer I tend to go with the brightest polishes for my nails. I guess I just take a cue from the beautiful weather and try to make my nails pop. However, it's not always the bright beautiful colours that that need to be worn in the summer, as light colors and pastels are so pretty to wear during this season. One of my favorite pink polishes to 'rock' on my nails would be the color Love Every Minute from Essie. Love Every Minute is a really pretty light pink polish that looks wonderful on all complexions. The color is not too light, which allows it to add a bit of pop and shine to the nail. I do recommend that you apply more than one coat of this polish, as it can be a bit streaky without more than one coat. If you want more gloss and durability, be sure to add a top coat! Overall, if you are looking for a lovely light pink nail polish to wear this summer, definitely check our Love Every Minute, and hopefully it will live up to its name! I hope you enjoyed reading this post! If you did, feel free to leave a comment below and Follow my blog with Bloglovin! Do you think Essie's Love Every Minute is a color you would want to wear? Have you ever wanted to meet other bloggers in your community? I know I have. In fact, this has been something I often think about, but there are very little opportunities to connect and build relationships with other bloggers/vloggers in my city. In order to fill this gap, I decided to team up with two local bloggers 'Why I Love Toronto' and 'Think Outside Of The Cloth' in order to create a organization that would bring like-minded individuals together in one space. Thus, our organization was created- conNEXTion! Although this organization targets vloggers/bloggers, it was important for all three of us to include: vloggers, photographers, social media specialist, designers, vendors and anyone in the digital media industry. Overall, we want to make this an organization that allows individuals from different areas to connect, communicate, collaborate, develop mentors and healthy relationship that can help them grow. Have you ever been to a blogger event? If yes, what did you think? I have decided to start posting some of my outfits of the day on a more regular basis. I am such a fan of fashion, so I figured why not share some of my style inspiration with you. 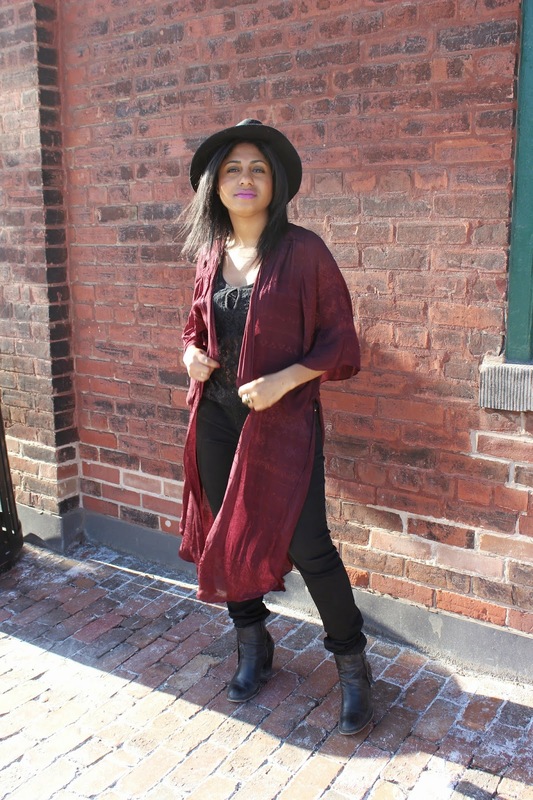 In today's outfit of the day, I am wearing a beautiful burgundy kimono from Urban Outfitters. Since the kimono is such a beautiful piece on its own, I wanted to make it the statement of the outfit by wearing black jeans, with a lace floral tank and bando placed under. To finish the overall look of the outfit, I added my H&M fedora to nicely compliment the kimono. Overall, I really love the look of this outfit, and I hope you enjoy it as much as I do. Below I have posted a few more pictures of my outfit of the day. Enjoy! Thank you for taking the time to read my post. Don't forget to subscribe to receive weekly updated of my posts. Do you love this Kimono as much as I do?